We love this beautiful mix of viola plants, and what a way to add instant colour to your autumn and winter bedding. 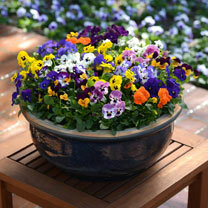 You’ll enjoy a selection of cheerful colours that together create a beautiful display, perfect for a pot or container. Better yet, you can look forward to months of colour as the flowers bloom from autumn through to spring. A great array of colours on this repeat flowering form to provide many months of colour. Flowers October-May. Height 11-20cm (4-8"); spread 11-20cm (4-8"). Supplied in 9cm pots. Ideal for beds and borders, patio pots and containers, rockeries. Scented. Attractive to bees. Grows well in sun or shade.